By 1910, ten percent of Ontario's population was French Canadian, most of it in the province's northern and eastern regions where they had moved across the border from Quebec. These Franco-Ontarians established a French-Canadian Education Association to promote bilingual education for their children. 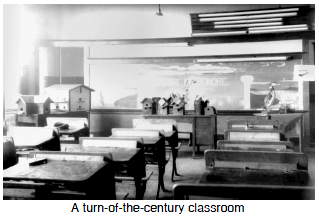 By 1912, opposition to bilingual schools was growing. didn't like the idea because it was "un-British" to be anything other than English-speaking and Protestant. The Irish Catholics didn't like it, either, because, although they wanted Catholic schooling, they wanted it in English. The Ontario premier, James Whitney, dealt with the issue by introducing Regulation 17 which made English the official language of education and restricted French to the first two years of elementary school. In 1913 it was changed slightly to allow one hour of French teaching a day. The reaction in Quebec was angry. Ontario was accused of being intolerant and not holding to the spirit of Confederation which they saw as a partnership of the two cultural, linguistic groups. Regulation 17 was also evidence of a disregard for minority rights by the dominant group. Henri Bourassa wrote editorials in his newspaper, Le Devoir, condemning the Ontario government and Liberal MP, Ernest Lapointe, introduced a resolution into the House of Commons calling for federal support of the Franco-Ontarians' rights. Prime Minister Borden didn't want to upset Ontario, however, now that he needed that province's support for the war effort. The Regulation was upheld by the Judicial Committee of the Privy Council in Britain which said that the constitutional guarantee of denominational: (referring to schools) having to do with some religious group or denomination.denominational schooling did not include language. French-English friction over Regulation 17 was still fresh when Borden introduced his Military Service Bill and it added to Quebec's anger over the call for conscription: the compulsory enlistment of men into the armed services by an act of law.conscription into Britain's war. On February 22, 2016 Ontario Premier Kathleen Wynne made a formal apology to Ontario's francophone community for the imposition of Regulation 17. She said it "showed a disregard for Franco-Ontarian identity and equality, and on behalf of the government of Ontario, I offer an apology." One of the strongest protests against Regulation 17 took place at Guigues Elementary School in Ottawa. Two of the teachers at the school, sisters Diane and Béatrice Desloges, refused to comply with the law and set up an alternative school after they were banned from Guigues. Eventually they and the students returned to the original building which was then guarded by mothers of the students, armed only with their hatpins. Regulation 17 was finally repealed in 1927 and bilingual schools were officially recognized.